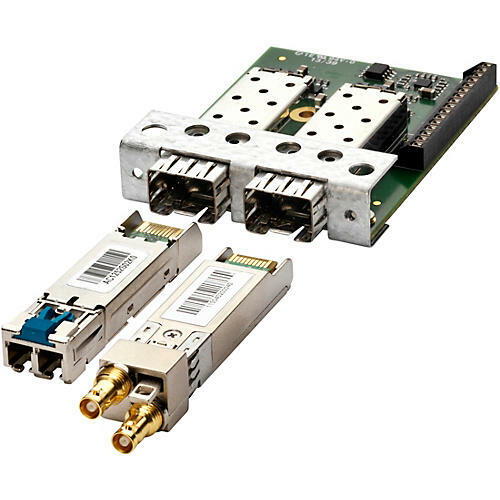 With the MTRX MADI Module for Base Unit you’ll be able to add up to 128 channels of MADI I/O via two 64-channel, bi-directional small form-factor pluggable (SFP) transceivers. The module is a small-format daughter board that fits underneath the MTRX motherboard. The MTRX solves a major problem in pro audio: syncing digital and analog formats to work seamlessly together. The unit delivers pristine sound quality with extensive monitoring and routing capabilities in a versatile audio interface for Pro Tools HDX, HD Native, and other pro audio applications. With MTRX, you gain the superior sonic quality of Digital Audio Denmark’s (DAD’s) legendary analog-to-digital converters, plus flexible routing and monitor control when used as a standalone device or with Avid Pro Mixing surfaces. And because the interface can be customized with all the analog and digital I/O you need, you can take on the most demanding music and post-production challenges. Effortlessly.